Although the central aim of training Aikido is to provide a way or path to follow that will help you overcome crisis, stress and discord in both your personal and public life, it is still a very effective martial art. Aikido will equip you to deal with opponents who may be armed or unarmed, acting alone or in a gang. There are no losers in aikido, for there are no contests. Aikido is a martial art that seeks to redirect and control aggression by the art of not opposing it. It does not seek to defeat or humiliate an opponent, or even to establish competitive superiority, but only to protect. Aikido is a modern Japanese martial art that owes its form and inspiration to one man, Morihei Ueshiba, known to aikido students worldwide as O Sensei, or "great teacher". O Sensei was born in Wakayama prefecture, Japan. When quite young, he had become a devotee of the martial arts. He studied at numerous schools throughout the country, staying at each until he became proficient in its particular system. At some point, Ueshiba began to suspect that the martial arts were more than just a means of defeating another person or of knocking him down. Typically, he decided to pursue this philosophical aspect further by entering a temple and spending many hours each day in solitude and meditation. It is said that the true meaning of the martial arts came to him as he was bathing at a well. He realised that they should not be concerned solely with force but were a way to develop a unity of mind and body. Aiki-jujutsu, as it was practiced, did not propound this philosophy so he decided to create a new art which would fulfil the principle of spiritual and physical harmony that he envisaged. He named this art "Aikido". The Aikido's technical inheritance is derived from Daito-ryu Aiki-jujutsu which roots 800 years ago, one of the many schools of unarmed and lightly armed systems of self-defence known collectively as jujutsu. These self-defence arts share many common characteristics. They all involve unbalancing and controlling an opponent by an intelligent combination of timing, manoeuvre and the subtle manipulation of body and limbs. The techniques are broadly divided into joint-locks (wrist, elbow, shoulder) and striking at vital points of the body. 1) Highly Efficient and Effective Self-defence Techniques: By coordinating one movement with another's, one could learn to bring the opponent's strength into one's own sphere, thereby neutralising the attack. 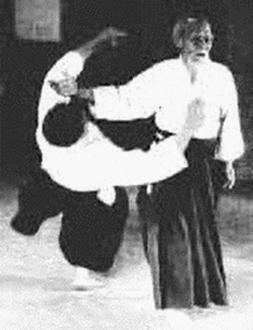 No matter what form it took, Aikido would only do enough to bring the attacker under control, using only small strength with as little physical harm as possible. 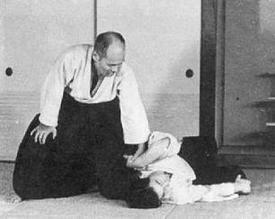 Aikido uses the principle of non-resistance, non-violent way of defending oneself. 2) Awareness and Self-reflection physically and mentally: By training with various people by size, gender, age and background, you can learn the physical safe space and timing to act when you need. In addition, you will rediscover your personalities and learn how to control oneself by going through hard training. 3) A way to harmonise with others and situations: By learning Aikido techniques and awareness, you can obtain the calmness based on confidence but not self-conceit. Knowing you have both physical and mental strength you can be humble and flexible fitting yourself to live in harmony both at private and public environments.